Compost bins are a great help when you are into gardening. Gardening is not the least expensive activity there is to do. In order to get that beautiful garden or grow healthy plants and yield a good harvest a bit of investment is expected. You spend on the plants, the water, the equipment and ornament, the gardener and garden designer and most importantly you spend a lot in making the soil rich and ideal for plant growth. How beautiful and healthy your plant grows to be is all dependent upon how rich your soil is. In making the soil rich and ready for planting, fertilizers are usually added to the soiled. The problem is fertilizers can be quite expensive and you don’t buy it for just one time, it is part of the garden’s maintenance. Good thing there is composting. Through process of composting, you can actually create nutrient-rich humus to add to your soil before you plant. In that way, your plant will receive all the nutrients that it needs. 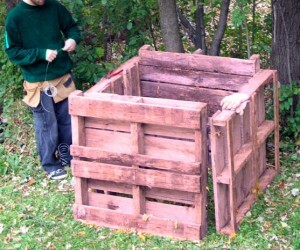 A wooden pallet compost bin is one type of compost bin that you can create on your own. The materials that you will need in order to make one are easy to find and you can even get them for free. As its name implies, the most basic materials used in making this compost bin are wood pallet. Wood pallets are used to hold materials being delivered to large companies. Usually these wood pallets are just thrown away. It would be lucky if you can manage to get some for free. For a single compost bin, you will use about 4 to 5 wooden pallets, but it will still depend upon the size of the pallets available and the size of the compost pit you want to make. The compost pit you can make out of the wood pallets is something that resembles a box. Each pallet will cover one of the four sides of the box-shaped compost bin. Nail the three pallets and attach the fourth one as a door using hinges. You can use the fifth pallet as a top cover if you want. Whenever you have to turn the compost all you have to do is to open the door and move out the contents and turn them and replace them all back again. You can also make a six-pallet compost bin if you want for ease of turning of the compost. Simply open the door and move the compost on the other bin. The one left empty can be used to collect new compost materials. If you have a big garden that needs fertilizing, you can create an even bigger wood pallet compost bin to hold a larger volume of compost. A wood pallet compost bin is very easy to make since all you have to do is put the pallet together to form a box-like enclosure. You do not need to be an expert in wood crafting in order to make it. It is a very large help in cutting back the costs of gardening as a whole.